A hospital stay is never fun, but since 2010, OPL has worked to bring joy to some of the children being treated at Nebraska Medicine, as well as their families and visitors. 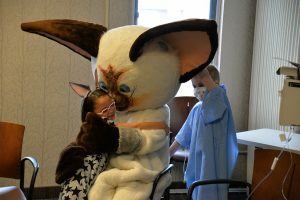 The partnership began with OPL loaning costume characters booked to visit library branches to Nebraska Medicine so that the characters could also visit patients. Characters are introduced at group storytimes with kids who are able to attend. They also make room visits for children who are in isolation or don’t feel up to attending the larger storytime. “Some of our patients can be here for months or close to a year, so they miss out on some of the normal kids’ activities. They always love it when the characters visit,” said Ardi Blazek, early learning developmental specialist at Nebraska Medicine. Children commonly want to give larger-than-life characters hugs or take photos with them, some adult patients who also request pictures, and the Nebraska Medicine staff can be observed smiling as they pass the characters in the hall. “The staff work in pretty intense situations, so it’s always nice to bring some joy to the unit,” Blazek said. The character visits also serve as a tool for the patients’ visitors. “We post pictures [from the visits] in the rooms and sometimes it’s a good conversation starter for visitors or people providing medical care, who can ask them about the visits and take their minds off of whatever else is going on,” said Lisa Gulseth, hospital teacher at Nebraska Medicine. Since 2013, OPL librarians have made bimonthly visits to the children being treated at Nebraska Medicine. Storytimes and various activities normally hosted at library branches are brought to the patients.